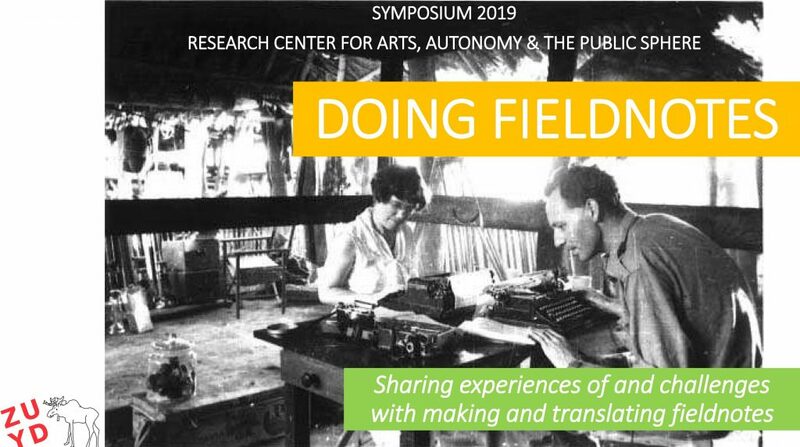 This one-day symposium focusses on a theme that most of us encounter in our research: making field notes. Our researchers do ethnography in a wide range of contexts: from educational settings in art classes to classical music rehearsals, urban spaces or discussion meetings. How to turn observations in these contexts into valuable field notes? And how do these different practices shape the kinds of field notes we take? During the day (from 10.30h to 16h), we will share experiences, discuss and question ways of making jottings, turning them into field notes, and ways of analysing them. Want to attend? Please send an email to ties.vandewerff[at]zuyd.nl! 13.30-14.00 Marlies Vermeulen & Remy Kroese (Dear Hunter/AOK): Fieldnotes in cartopological maps. 15.00-15.30 Ulrike Scholtes (UvA/AOK): Putting bodily knowledge to paper – on drawing as a practice-specific way of thinking?